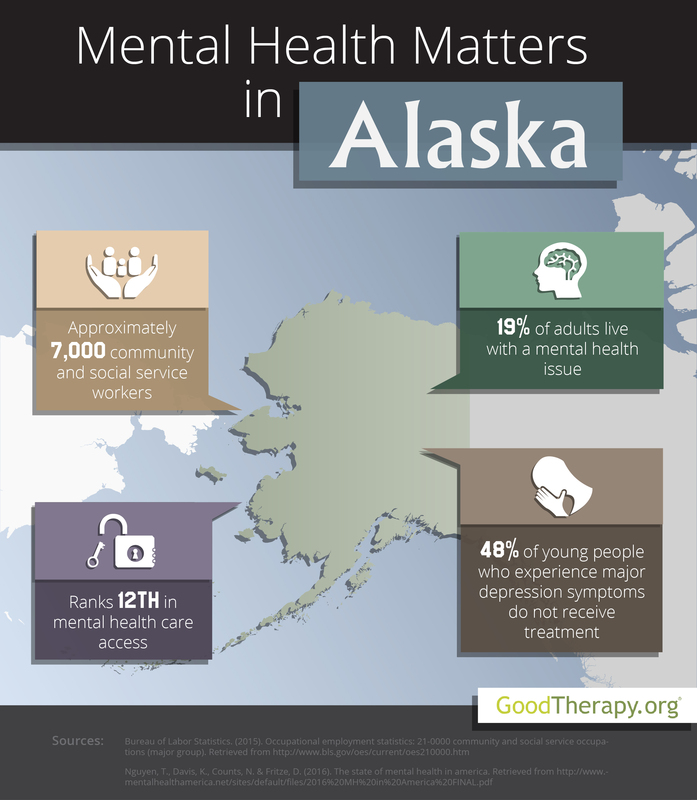 Find a therapist in Alaska with GoodTherapy.org. According to the United States Census Bureau, Alaska was home to an estimated 738,432 people in 2015. Data from the Bureau of Labor Statistics indicates approximately 7,000 Alaskans work in the social and community service sector as therapists for substance dependence and behavioral issues, counselors in rehabilitation centers, guidance counselors, religious workers, probation officers, community health workers, social workers, psychotherapists, and marriage and family therapists. In Alaska, these workers earn an annual mean salary of $50,870. In 2016, Alaska received an overall ranking of 9th—out of all 50 states and the District of Columbia—in the annual mental health survey conducted by Mental Health America (MHA). Researchers suggest this ranking correlates with relatively low rates of poverty in the state. Alaska was 7th in overall youth ranking, which suggests a low prevalence of mental health issues and high rates of access to mental health care for young people. According to 2016 MHA survey, the state has the second lowest percentage of adolescents with illicit drug and alcohol abuse issues. Reports from the Substance Abuse and Mental Health Services Administration (SAMHSA) claim during 2012-2013, the percentage of Alaska residents ages 12-20 who engaged in binge alcohol consumption was less than the national average; additionally, the percentage of Alaska residents with substance abuse and dependence issues who received needed treatment was greater than the national average from 2009-2013. A relatively high percentage of young people with signs of depression tend to receive needed treatment from therapists and professionals working in mental health in Alaska. Data from the 2016 MHA survey indicates that Alaska is ranked 5th in providing consistent depression treatment for young people with severe major depression symptoms. Despite the state’s overall high rankings, there are some statewide behavioral and mental health concerns which have been identified. According to Mental Health America, the state was ranked 41st for adult dependence on illicit substances, and 40th for adults with serious thoughts of suicide, both of which indicate a high prevalence. Roughly 59% of adults with a mental health issue did not receive any form of treatment, while 16% of adults with mental health issues are uninsured. Residents with mental health concerns are urged to find a therapist or reach out to any residential treatment centers, detox centers, or other mental health treatment facilities in the state. While therapy may not be able to remove every adverse issue, many people do experience an improved quality of life after receiving professional mental health care.